1. More than 600,000 people live in New York City housing projects. These are projects built primarily during the 1950s to accommodate low income tenants, who tend to be mothers with children on welfare and elderly people on SSI. In order to save money this December, Mayor Giuliani has ordered the heat in these buildings to be turned off. Under the Mayor's rule, unless the outside temperature falls below 45 degrees, the heat in these buildings is to remain off. Private landlords in buildings with rent controlled apartments must maintain the inside room temperature at 65 degrees, or else the police will come and arrest the landlord and put him in jail. Tenants who want to get their landlord arrested are known to turn off the heat, open all the windows and let the wind blow through, to get the temperature down below 65 degrees. However, Rudy Giuliani keeps 600,000 poor people with children in apartments at a 45 degree temperature and nobody has arrested him yet. 2. 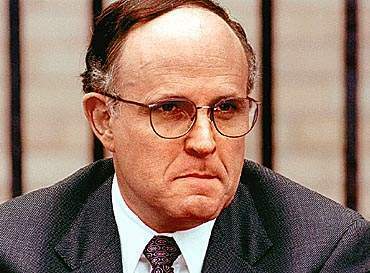 In order for a woman to stay on welfare, Rudy Giuliani has decreed that she must have a baby every 3 years and 4 months or else lose all benefits. The way this works is that a single mother must go to work in a "workfare" project in order to keep her benefits, unless she has a child under three years old or unless she is at least five months pregnant. 3. Mayor Giuliani has ruled that if a homeless woman comes to a New York City shelter with her children, the children are to be taken away from the mother and put into foster care and the mother is to be put to work. This has greatly reduced the number of women and children in city shelters. 4. Mayor Giuliani has greatly reduced the welfare rolls by simply dropping large numbers of welfare recipients from the rolls. More than 40% of all welfare recipients have been unilaterally dropped from the rolls in this manner. Almost all of them are single mothers with children. In most cases, the welfare recipient is able to obtain a hearing and is eventually reinstated, but by then the city has saved several months in welfare payments plus the welfare recipient is usually dropped again shortly thereafter. 5. Last summer, Rudy Giuliani turned off the hot water in New York City housing projects. As a result, city housing residents were not allowed to take a hot shower or to have hot water for cleaning or other purposes. However, private landlords in buildings with rent controlled apartments must maintain the hot water at the tap at 120 degrees or else the police will come and arrest the landlord and put him in jail. 6. Mayor Giuliani has reduced crime by random stop and frisk measures. The way this works is that the city police simply stop young black men at random on the streets. The young men, who are usually teenagers, and handcuffed and lined up against the wall and body-searched, usually in front of a crowd which has gathered to see what is going on. More than 80% of all black teenage males report that they have been searched in this way. If no weapons are found, the handcuffs are removed and the boys are released. Mayor Giuliani defends this practice by saying that 80% of all crimes are reported to have been committed by black teenage boys. For some reason, these and the many other enlightened reforms introduced by our great mayor have raised criticism. The daily newspapers now refer to him as "The Midtown Mussolini" and "Hitler on the Hudson". Police Commissioner Howard Safir testified Mayor Giuliani has received 80 death threats so far this year. Nobody has killed him yet, however. City residents are gratified that the mayor finally made the trains run on time. Rudy Giuliani did this by threatening city workers with a fine of $25,000 each worker per day if the trains did not run.